Using your touchscreen device in the middle of winter is so frustrating. 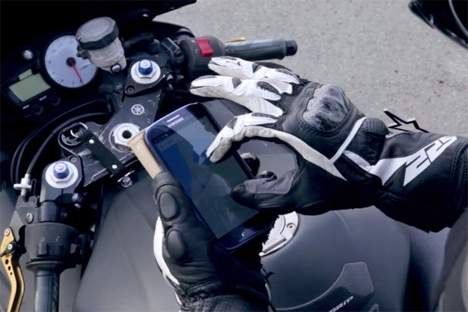 You either have to take your gloves off or spend a ton of money on a pair of capacitive touch gloves that work even when your fingers are covered. A new product called Nanotips will solve your problem by letting you turn any pair of gloves into a pair of capacitive touch gloves. The liquid is a conductive polyamide solution that fools your touchscreen into thinking that your gloved fingertips are naked human skin. You paint it onto the thumb and forefinger of your gloves, kind of like nail polish, and wait for it to dry. When it does, you’re ready to start using your phone or tablet outdoors with your hands nice and toasty. The liquid isn’t permanent; it only stays put for a limited time. How long it lasts depends on how you use it and how often. The solution comes in blue (for textiles and fabrics) or black (for thicker, heavier materials). Each bottle costs $20 and can treat 20-30 fingers. See more in Industrial Design or under Technology. March, 2014.